In episode #18 of Craft Works Dialogue, guild member Brian David Johnson sits down with fellow member Mark Macek of Macek Furniture to have an in depth conversation about Mark's work, his early life and inspirations and how a career that began with the study of architecture at the University of Texas led Mark down a path to become one of the more respected furniture makers in the city. Mark currently teaches a wood work and design course at UT in addition to running his custom furniture business. This informal talk can be downloaded for free on iTunes here , or for non iTunes users here. 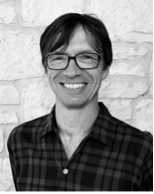 Brian David Johnson has been building custom furniture and fine cabinetry in Austin since opening his own studio in 2002. In the fall of 2009 he established BDJ CRAFT WORKS, a line of small hand crafted production works. Brian also hosts the podcast Craft Works Dialogue. Listen in as Brian sits down for an in depth conversation and interview with various craftspeople, designers and artists to discuss their work and their lives. To listen click the link below.